Then, just as we were feeling really smug and happy with ourselves, we got another message telling us the video views were at 9,500. Now, as of writing, the views were up to 23,000 after just one week. Not bad for someone who said her next most shared video had about 200 views! 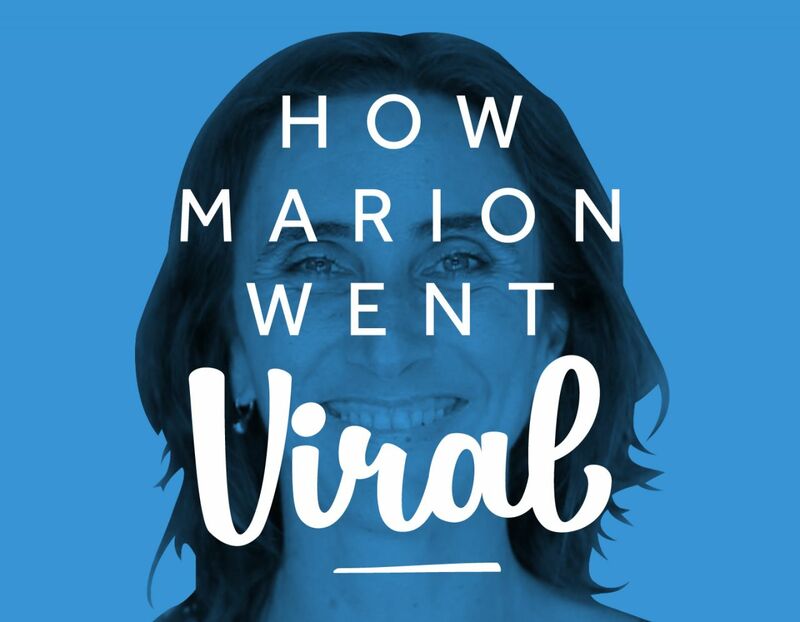 We decided to have a chat with Marion to find out a bit more about her business and how Biteable has changed the way she looks at video as a medium. Biteable: Tell us about your business. Marion: I work mostly with mothers, in two ways: 1. Helping them understand their babies and children, to give them the most helpful start in life; 2. To help mothers free themselves from guilt and self-judgment, to meet their needs and listen to their feelings so that they can give their children what they need. I have 15 paid online courses and a similar number of free ones. I also offer some private sessions. Biteable: How long have you been running your business? Marion: In this format, for 11 years. Before that I also worked with mothers, around birth, and before that I was a psychotherapist in private practice. Biteable: How dependent on the internet is your business? Biteable: How many people typically see your social updates? Marion: It really varies. It can be 50; but with video it might be 500. Marion: 23,000. It was up to that after about a week! I’ve never seen anything like it! Biteable: Why did you decide to try video? Marion: My business mentor keeps inspiring me to use video. Marion: My business mentor did one and I thought I’d like to have a go. Biteable: What has this Biteable video meant for your business? Marion: Tangibly, I’ve had a lot of sign ups for my newsletter and some sign ups for courses. I was asked to do a couple of interviews. But most of all, I had literally tens of people responding to my work with celebration and acknowledgement, who shared the video with their social network. Personally, it was one of the MOST fulfilling things professionally so far - sharing my passion with so many parents and having people respond in such incredibly passionate ways. I was on a high for days! Biteable: Have you seen an increase in business or internet traffic since you posted your Biteable video? Marion: Completely different! So much more effective! I have made some more Biteables and can’t wait for more video clips, because I just LOVE making them! Marion: That it is so easy to make something that looks so professional and that is so incredibly inspiring for people to watch. I love it!